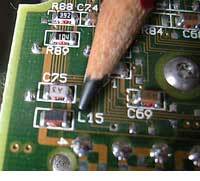 • Apply the right hand grip (or curl) rule for a solenoid. • Recognise inductor schematic symbols. Fig. 3.3.1 The Right Hand Grip (or Curl) Rule. The Right Hand Curl Rule for a Solenoid. 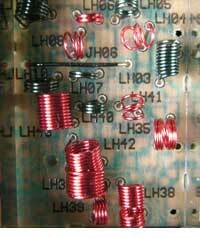 Many practical inductors are based on the solenoid. Because of its shape, the lines of magnetic flux are concentrated along the centre line of the coil and this produces a magnetic field with a north and a south pole. 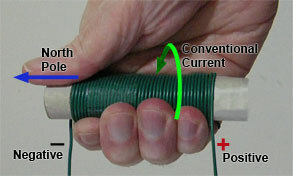 To find out which end of the solenoid is the north pole, imagine grasping the solenoid in the right hand as shown in Fig 3.3.1 with the fingers curled around the solenoid in the direction of CONVENTIONAL CURRENT FLOW, from positive to negative around the solenoid, the right thumb is laid along the side of the solenoid and will be pointing towards the solenoid´s north pole. 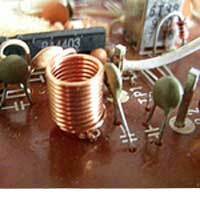 Simple air cored inductors are used in many circuits operating in the 1MHz to several hundred MHz range, including VHF FM radios and TV receivers. 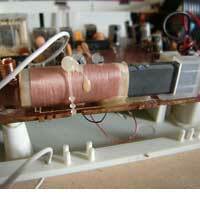 AM radio receivers use internal antennas that have a number of inductors wound around a ferrite rod. These are combined with fixed and variable capacitors to enable the radio to be tuned to the various station frequencies. Toroidal (ring shaped) cores are very efficient at concentrating the magnetic flux within the coil and are often used for large current inductors and transformers, such as those used in power supplies. Surface mounted multi-layer chip inductors are tiny; often only 3 or 4mm across. Although this physical size limits the values of inductance that can be achieved, typical values of less than 1nH up to a few hundred nH are useful for many radio frequency and communications applications. The example shown is part of a hard disk drive control circuit. 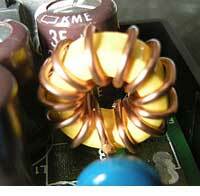 Air cored inductors for UHF applications may consist of only one or two turns of wire. In some cases even a straight-line conductor, a few millimetres long can have enough inductance to form a useful inductor or transformer. In these situations the exact positioning of inductors relative to other components or metal casing, such as screening cans, is vitally important. 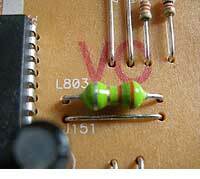 During construction individual inductances may have had their inductance fine-tuned by slightly altering their positions, or the spacing between turns. Fig. 3.3.3 Inductor (Schematic) Circuit Symbols.